"Jews in Berlin" and "Berlin! Berlin! ", two new titles from Berlinica Publishing. 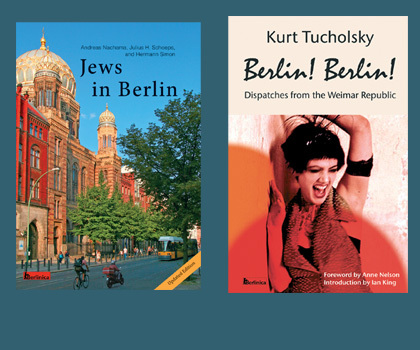 Professor Schoeps will speak on the updated, English edition of the classic Jews in Berlin, which presents a comprehensive spectrum of Jewish life in this cosmopolitan city from the thirteenth century to the present. This whirlwind tour of Berlin’s fascinating history will focus on recent developments where young people from Tel Aviv, London, Paris and New York are choosing to live in Berlin. The resurgence of Jewish life is an important and wonderful reason why this decade-old book has just come out in a new edition. Kurt Tucholsky was a brilliant journalist whose biting satirical dispatches and early distrust of the Nazis forced him out of Germany into exile. He was banned, his books were burned, but his writings survive, available now for the first time in English. Professor Schoeps is Professor of Modern History at the University of Potsdam where he also directs the Moses Mendelssohn Center for European Jewish Studies. Anne Nelson is the author of Red Orchestra: The Story of the Berlin Underground and the Circle of Friends Who Resisted Hitler and teaches at the School of International and Public Affairs at Columbia University.